There have been many changes in the healthcare industry in the past few years. Many of those changes have been spurred by advancements in technology. Machines are smaller, faster, and more efficient. Computers can process and hold more data than ever before. Networking capabilities allow the near-instantaneous sharing of information across multiple locations and platforms. These advancements and more have led to innovations in medical equipment and improved point-of-care service. Medical computer carts are a part of this innovation. Since the medical computer carts in question are on wheels, they can go wherever you go. You don’t have to worry about a workstation that might not be functional, or which workstations are connected to which networks. They can also be locked away from public access when not in use, to reduce security issues. A medical computer cart on wheels allows a medical care professional to take many tools with them. Carts can be fitted to contain a large number of peripherals or storage options, so you have what you need at hand. This helps cut down the time you spend running back and forth, reduces clutter, and lets you put more focus on the patient. An example of a peripheral that improves point-of-care service is hand scanners. 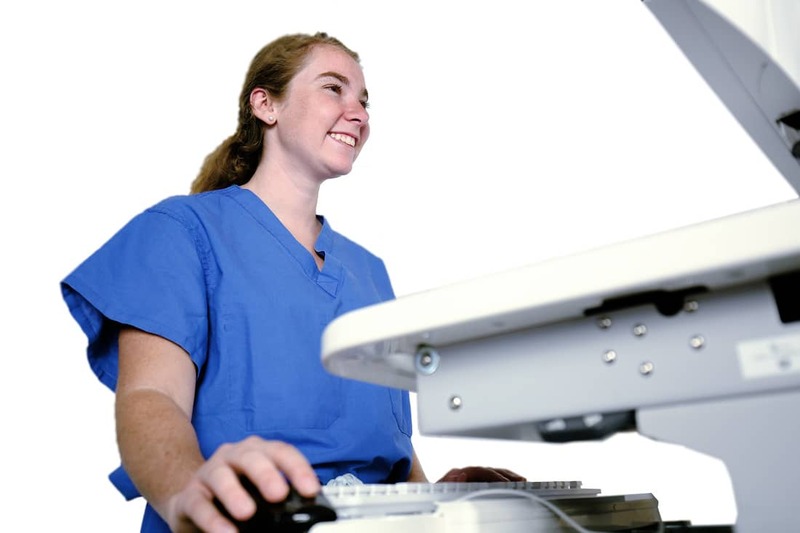 Hand scanners attach to a medical computer cart on wheels and improve point-of-care service, by making it easier to keep track of tests, medications, etc., for a patient. Just scan the barcode on the patient’s wristband, scan the medication being administered, and everything is logged into the system automatically. Scan samples taken from a patient and those samples and their subsequent results are automatically tied to the patient’s chart. Scanning reduces mistakes from hand typing and ensures all data is tracked and assigned to the correct files. 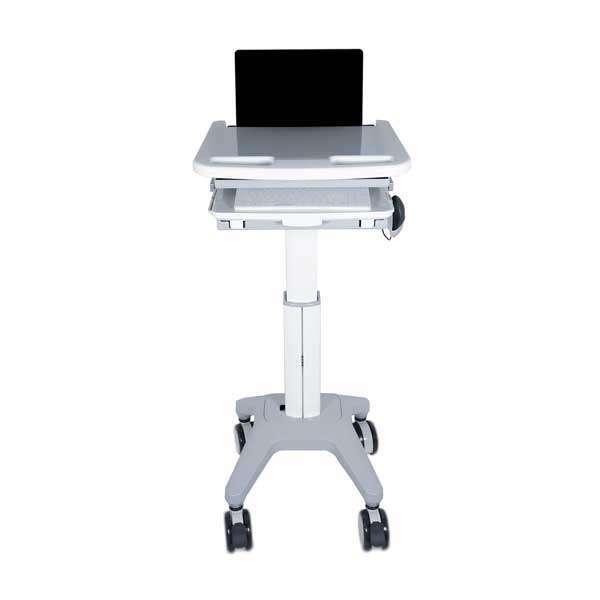 Medical carts on wheels also allow the practitioner to access or input data anywhere at any time. Previously, many nurses or doctors would speak with a patient, then walk to nearby station to input data. It is easy to get distracted and forget something when moving from one room to another. Medical computer carts allow you to enter notes or data, or even order tests or medication immediately, which reduces mistakes. The carts also allow information to be shared with patients right there in the room. Carts can be turned, or the screen swiveled, to give the patient a view of the screen. This allows them to see images as you discuss them or double check that information was entered correctly. This helps make the patient feel involved in their treatment and helps foster the bond between patient and care provider. It also facilitates better discussions about testing and treatment. Medical computer carts also make data sharing much easier. Before, medical files were transported manually by patients or mail services. Files would go missing or arrive damaged and hard to read. With computer carts, the practitioner can instantaneously access networks where electronic health records are stored. And these networks are available to multiple providers at once. This allows providers access to all a patient’s information during a visit, allowing a more comprehensive view of the patient’s health and history. Sharing information reduces the number of unnecessary or redundant tests, saving both time and money.